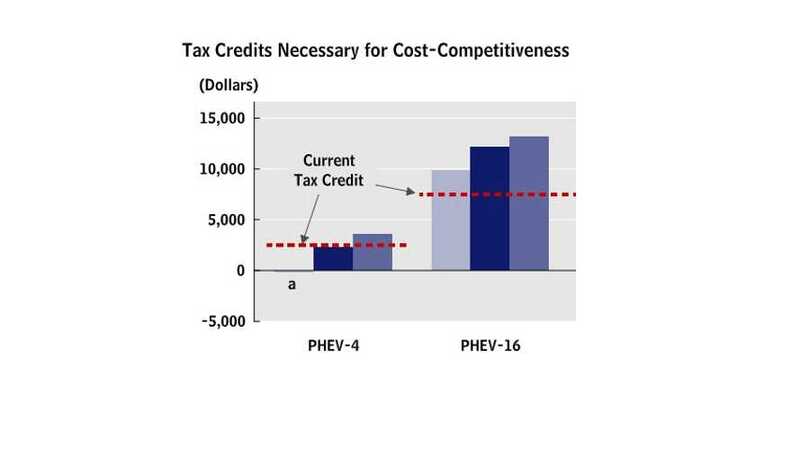 Budget Office Says EV Incentive Programs Will Cost $7.5 Billion By 2019. Not Really working. About 25% of the cost to promote electric (and some other advanced fuel efficient vehicles) comes from the federal $7,500 credit program, which applies to the first 200,000 vehicle sold by each manufacturer in the US. The bill for this program, according to the US Budget Office will cost US taxpayers close to $2 billion dollars, provided it continues as planned. The overall price behind the federal government's goal of getting "a million EVs on the road" when all the programs and costs are tallied, is $7.5 billion. The federal government has adopted several policies to encourage the production and purchase of electric vehicles, which run partly or entirely on electric power stored in a battery that can be recharged from a standard home outlet. Such vehicles are fairly new, having been reintroduced commercially in the United States late in 2010. Federal policies to promote their manufacture and purchase include tax credits for buyers of new electric vehicles, financial support for the industry that produces them, and programs that promote efforts to educate consumers about electric vehicles and improve the infrastructure for recharging them. The Congressional Budget Office (CBO) estimates that such policies, some of which also support other types of fuel-efficient vehicles, will have a total budgetary cost of about $7.5 billion through 2019. Of those federal incentives, the tax credits for buying electric vehicles—which account for about onefourth of that budgetary cost—are likely to have the greatest impact on vehicle sales. In the lengthy study (44 pages-link at bottom of article), the government breaks the study of electric vehicle down to two types; the fully electric EVs (Nissan LEAF, Ford Focus EV, to anything from Tesla) and the plug-in electric hybrids (Ford C-Max Energi, Chevrolet Volt, Toyota Prius plug-in). We Need Gas To Be How Much To Make Us Really Buy Plug-Ins? Tax credits will have little or no impact on the total gasoline use and greenhouse gas emissions of the nation’s vehicle fleet over the next several years. While this seems contradictory, the report goes on to say that "as automakers seek to comply with the rising federal standards that govern the average fuel economy of their vehicle fleets, they can use increased sales of highfuel-economy electric vehicles as an opportunity to boost their sales of low-fuel-economy vehicles as well. " Basically, the size and scope of CAFE regulations are to blame. 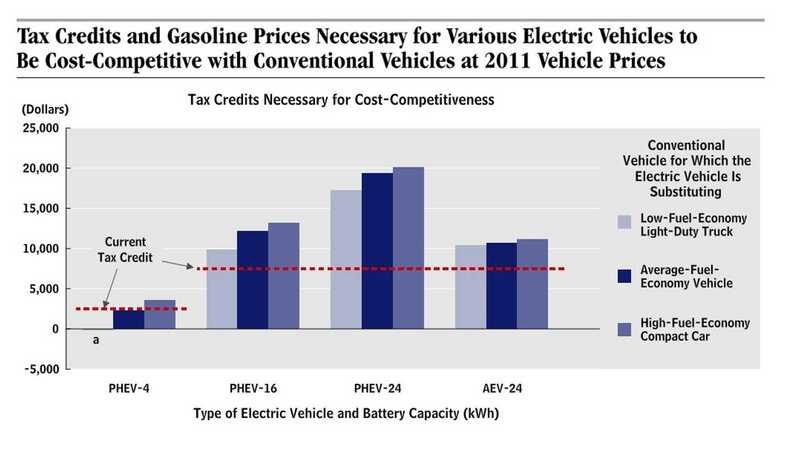 The takeaway from the study is that the larger an electric vehicle’s battery capacity, the greater its cost disadvantage is and the greater the need for a variable tax credit to adequately make it cost competitive. Basically, plug-ins need more money, because as it stands the study finds that although the $7,500 credit helps, it doesn't make up the whole gap, so the majority of the plug-in sales today would still have happened without the tax credit. Increasing the Tax Credit: The CBO boldly does not give a straight answer, saying it would be hard to predict anything other than it would up the expectation for additional sales. 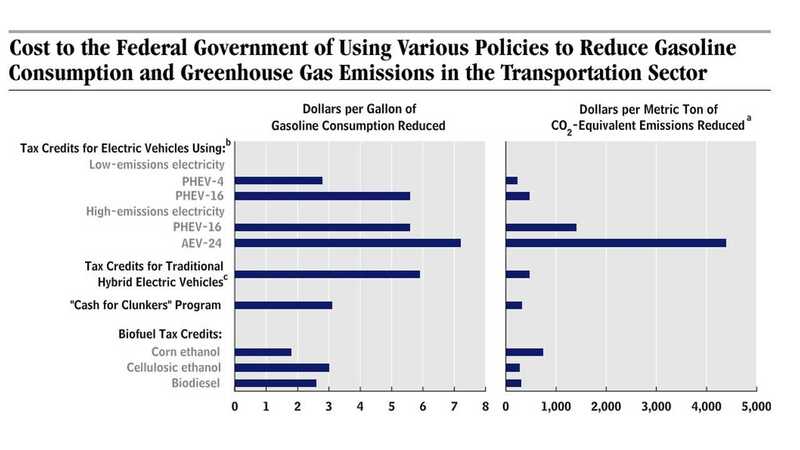 The CBO does say that what would effect the use of gasoline, the adoption of electric cars and most cut GHG emissions; the addition of a gas tax. While this has always been a environmental no-brainer, the US is one of the last protectors of keeping the cost of gas artificially low, and therefore it is most likely this "low cost" gas policy that is most causing the inequality between plug-ins and standard gas vehicles. 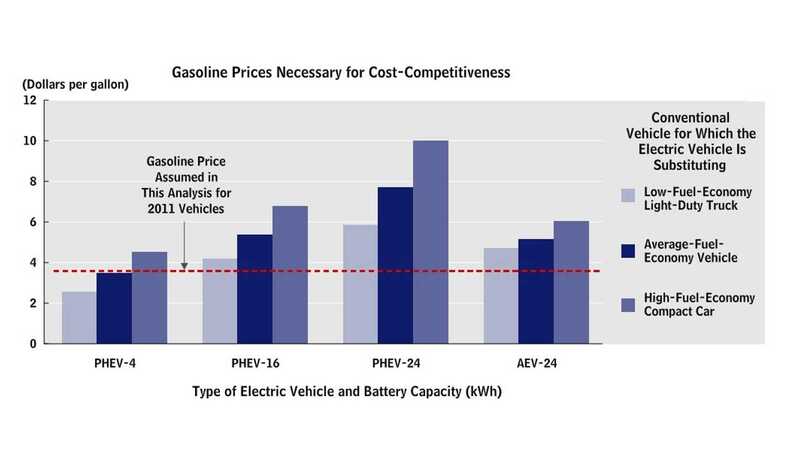 Nutshell: Don't make EVs incentives higher, just up the price of gas and that increase will float all boats...except in people's pocketbooks.